During the Renaissance, the German artist Albrecht Durer was the most acclaimed printmaker of Northern Europe and his well deserved reputation can be seen in two notable series of woodcuts. Both of them include the theme of Christ saying farewell to his mother before leaving for the events awaiting him during the Passion. The first series called Life of the Virgin was started in 1501 but not completed until after he returned from an extended visit to Italy. A second series called The Small Passion was started after his return to Germany. In his woodcuts, Durer deals with a wide range of emotional moments; sometimes there are elements of joy, as in Christ Entry into Jerusalem, yet often there are sorrowful events such as the Crucifixion. Durer used Biblical accounts usually for the subject of his woodcuts but many activities in the life of Christ, as well as in his family and disciples, were not recorded in the scriptures. When direct accounts are not available, artists, novelists, and dramatists often turn to their imagination or go to other sources as they try to depict how events might have occurred. During the thirteenth and early fourteenth century there was much devotional material written but the exact authorship was not always known. Many works that were at one time attributed incorrectly to St. Bonaventura now are called generally, Pseudo-Bonaventura. Durer’s source for Christ Taking Leave of His Mother is from one of the most popular of these works; “Meditations on the Life of Christ.” The thought of Christ’s farewell is emotionally heart wrenching, especially in view of the fate awaiting him in the days that were to come. This subject received much attention from artists in Northern Europe during the fifteenth and sixteenth centuries and numerous variations of this theme were painted. 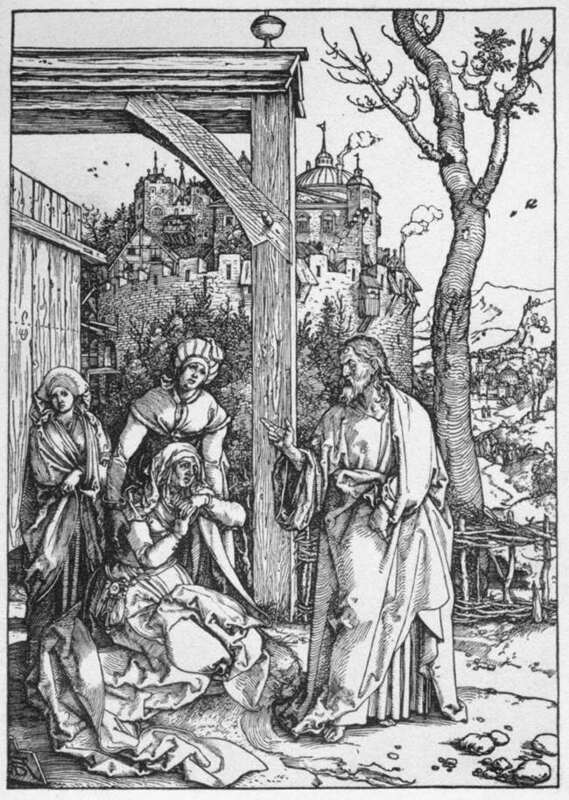 In Christ Taking Leave of His Mother (from the Life of the Virgin), Durer lays out the composition in three divisions. Mary is on the left side seated on the edge of a covered porch; her dress is crumpled, her face shows sorrow, and her hands are clasped below her chin. Two women, also with sorrowful expressions, are standing behind her and are part of this group. Christ, near center and a few feet away to the right of them, raises his hand to bless his mother. Two strong vertical elements, the post of the porch and a dead tree suggesting gloom, serve to frame him and at the same time they tend to visually separate him from his mother and the two women. As our attention moves to the right beyond the figure of Jesus we see a third division; open space and a road that will lead Christ to the world beyond. On the road at mid-distance are the disciples waiting for Jesus to join them. In the background, looming over this sorrowful farewell – and possibly intending to suggest the presence and weight of the physical world – is a huge fortress-like cluster of buildings that is based probably on buildings in Nuremberg during Durer’s time. This woodcut is not quite nine by twelve inches in size; about the size of a standard sheet of notebook paper. Yet Durer filled it with an incredible amount of detail. He presents the primary action in the foreground and then takes us back convincingly into an illusion of very deep space. Durer was a master of black and white values and he skillfully created “gray” tones; even though there are no actual gray tones in this print. The entire surface of the woodblock is of a “yes-no” nature. That is, the surface of the block is either all cut away (to give the white areas) or left uncut (for the dark lines). The various degrees of gray values are achieved by how near or apart the cuts are made to each other.